As shown in the graphic, biodegradable plastics are made from raw natural materials and are usually plant-based. But labeling on bags and packaging can be misleading if they say “biobased.” Biobased materials aren’t necessarily compostable because they sometimes only contain a small fraction of biodegradable materials or are built to mimic the durability of petroleum-based plastics. What does that even mean, though? Basically these are the kinds of plastics we don’t want hanging around the compost bin. Some consumers see the prefix bio- and assume “hey neat, this is green, I can compost this,” but biodegradable plastics have standards, just like we all should with our dating lives or diets. The ASTM D6400 outlines the provisions that have to be met for a bioplastic to be labeled as biodegradable. Some states have stricter guidelines for labeling to further avoid confusion. 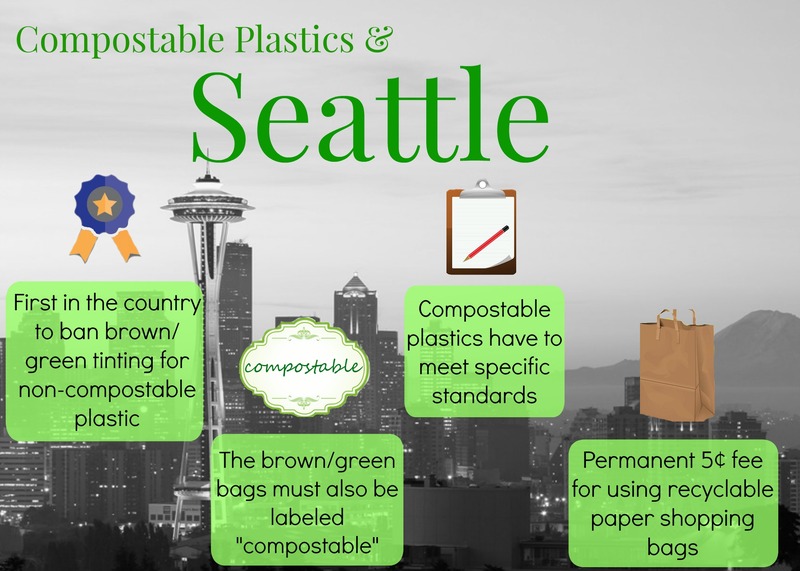 Unsurprisingly, California and Washington both have legislation addressing compostable plastics. Love it or hate it, the West Coast is usually on their environmental game. Labeling standards become more important as companies catch on that “greenwashing” their products is hip to the latest trend. Seattle’s city council recently voted to enforce labeling standards so this issue could be avoided.